Have you ever wanted something so badly that you went on an epic adventure? This is that post. Okay, I may be stretching the truth a bit. But sometimes the truth is boring and it’s more fun to embroider. The truth is I sent someone ELSE on an epic adventure on my behalf. Yes, I totally pulled an Elrond. Since the epic journey involved two big people and two slightly-less-than-hobbit-sized kids on a trip to the states, you might even argue that their little fellowship had to be subjected to the all-seeing eye of the Illuminati Sauron for this on their quest to Super Target Mordor. I could do this all day. It’s payback for my kid watching LOTR: Extended Editions like 12 times. Misery loves company. So this all began sometime like a year and a half ago when I lost my job and therefore had no reason to come within close proximity of Pam’s for my one guilty pleasure: a chai tea latte. Sure, I tried others–bag teas, mostly–but they just weren’t the same. I needed a powder. An instant tea powder, one that would dissolve smoothly into milk, with all the intense spice flavourings I was accustomed to with my latte. And maybe if I knew exactly what was in it, I could feel less bad about it, given that I generally pride myself on DIY and scratch things. And so I began to scheme and research and do other typical internet troll things that mostly involve shopping, looking for instant tea powder. And that’s when I realized that unsweetened, unflavoured instant tea powder is a bonafide G-D unicorn in Canada. I could track the Ark of the Covenant down easier online than I can find a tea powder that doesn’t taste of lemon and too much sugar. After much searching, I concluded that the only way to obtain this beast was to travel to the depths of America (AKA Buffalo, NY) passport in hand. Or make someone do it for me. I don’t get the fundamental weirdness between American and Canadian iced tea. Tea is tea, in America. It must be brewed with hot water, or perhaps set to slow-brew in the sun. Restaurants in the deep south have machines that look like giant coffee pots without burners, and they are made just to brew tea that will be served over ice. It’s served with nothing but ice and lemon wedges. Maybe a straw. If you want to add sugar to it, that’s your business. But you do it after. Here in Canada, tea comes in a bottle or from a soda fountain (????) loaded with sugar and lemon-ish taste. And this is the only way you can have it. There is no other tea, not unless you want to ask your waitress for a glass of ice, hot tea, and a wedge of lemon–and then endure her weird looks when you proceed to demonstrate the proper brewing of iced tea at the table (I have done this). I actually failed a blind taste test between a bottled lemonade and an iced tea, which means to me that Canada’s idea of iced tea is oversweetened brown lemonade. BROWN LEMONADE. Seriously, I cannot make this up. Sweet ice tea is nas-tea. Oh right. Unsweet unflavoured instant tea powder, rare like four leaf clovers in the Sahara Desert. Canada would be the desert. So when a friend from Elora happened to drive through town and asked me to take care of a broken phone that she forgot to take out of her car (I had no idea you could have the wrath of the Border Crossing Guards brought down on you by the inability to prove your phone is a working phone) I told her sure. Pick me up some unsweet tea powder while you’re there, would you? And she did. She braved the hoard of orcs American shoppers at Super Target and brought me home three glass jars of Lipton unsweetened ice tea powder. And that was the hardest part of trying to make this stuff. Literally. I already had all the spices and was able to whip it together in about two minutes flat. And I did so and had my tea. And it was good. This might be anti-climactic, but what are you going to do about it? If you don’t like the way this ended, then allow me to entertain you with a Action-oriented director’s cut meme, heist version. 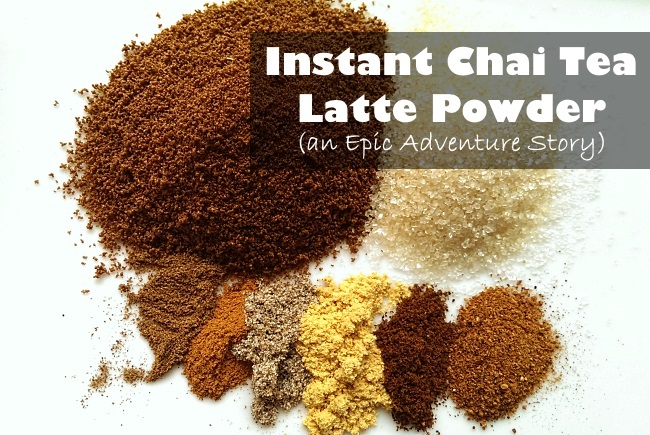 A quick fix powder to make chai latte right at home with hot milk. Makes a great Christmas Gift for teacher! Mix all of the ingredients and store sealed. Make sure you store in clean *dry* containers, as any moisture will cause the instant tea to become tea. Love Me? Share this on Facebook and Pinterest! I am so happy to read this post! I can’t wait to try it! Tea is tea! Yes! Hot or cold. Yes! It is NOT brown lemonade!!!! *gags* Ewwwww! 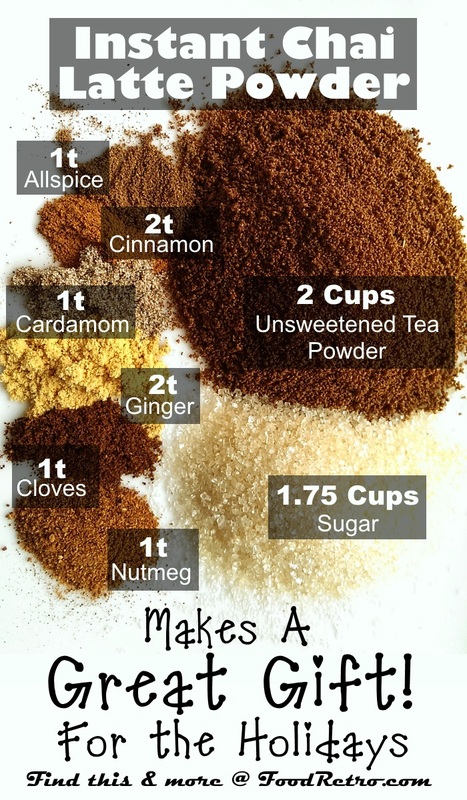 So straight up, I don’t think that I can go through the quest of finding all of the ingredients for chai latte powder (I haven’t become obsessed with chai because of the caffeine) BUT the picture looks beautiful! I mean, who thought that tea could look pretty! Also, love that html encoded rant — were you a programmer in a previous life, or is this part of the blogging transformation? Haha, I did HTML sites way back in the day and now still do web dev on the side for extra dosh. Lots of mamas need blogs, and I’m happy to provide. I can write nerd rants in perl, too. The only part that was a little hard to find was the tea powder. If you’re stateside, then you’ll have it easier than I did. And… a little caffeine is good for you! Check out Angila’s guest post on my site about being a tea snob. 😉 I’d actually argue that the sugar is the bigger bozo, but I don’t eat much of it. If you want to avoid refined sugar you can always leave that out and sweeten with honey or a little stevia to taste. That pic is definitely pin-worthy! Or pin-up-worthy! I’d say a winter month … Ms. January perhaps? PS. I LOVE chai latte but would never (in a million years) attempt to make this because my kitchen hates me. It’s a bonafide fact. That said, I’m also a rebel. I WILL TRY TO MAKE THIS. Mona, I’m happy to say that this recipe is totally Mona-proof. You don’t have to cook anything at all, just measure stuff out and stir it together. 😀 You can even totally slack when making your hot milk by putting a mug of milk in the microwave to warm it up. No stove involved. How big of a container would you need to put all of this in? Hi Jackie! It makes about 4 cups of mix (very slightly over by my measure). If you’re not breaking it up into a bunch of smaller containers, you need one container that can hold about a litre, or just about 4 250ml jars. You can heap the measures slightly to round up to 4 full 250ml jars. I just made it and it’s delish! I did taste tests and added another teaspoon of cardamom and 1/2 teaspoon of clove and a dash of freshly ground pepper to mine. I love recipes I can tweak to my own tastes. Now to put some one jars for last minute gifts. Thank you! The allspice and the nutmeg have to be real fresh to make it great. I can’t wait to try your recipe! Didn’t think the rude reference to Americans was necessary. what is tea powder and where do you find it? 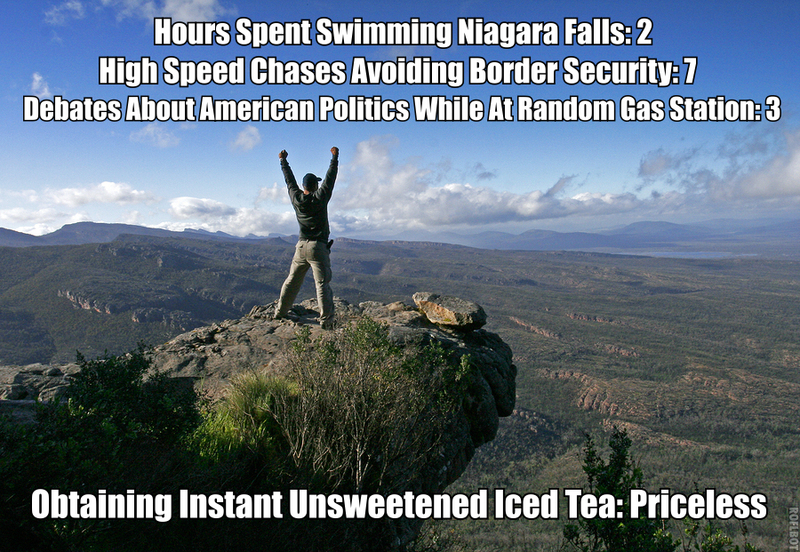 I’m in the U.S.
It’s dehydrated tea, or usually called instant tea. You can usually find it in the same place as other dehydrated instant beverage powders (like instant coffee, kool-aid and the like), and I’ve found it in most grocery stores and Super Targets in the states that I’ve been to from Maine to Florida. Lipton makes unsweetened tea powder if searching by brand helps. It comes in a glass jar. So is it ok then to use instant ICED tea powder? I have been looking all over for instant black tea powder and it is hard to come by! So first off, thank you! I love Chai Tea, hot, cold, blended, iced, doesn’t matter! First I realized I should have mixed this in a pitcher rather than glass bowl. I had to spoon a little at a time into the Mason jar for storage. I noticed that it doesn’t really mix up well… is this normal? I suppose I can just shake the jar before using. Also, when mixing the tea powder really got to me… I think it was in the air and I was breathing in powder particles! Lol. Does this have to go in milk… can I just use hot water? Can’t wait to try it! It is normal… the sugar is bigger than the granules of the tea and spices, so it tends to “float” to the top, but a quick shake stirs it all up pretty good again 🙂 I have a big pyrex bowl with a spout lip, which I find is perfect to the task for me. Measuring scoops and funnels though can also do the trick. You can use water, but it will be significantly different. You can try adding it to a portion of dried milk powder for a truly powdered mix, but I haven’t gotten the ratios right… yet. 😉 You are welcome, and thanks for reading! Cover your mouth when dumping the tea out… it can be irritating. Thanks Jenn! I think you’ll like it… It’s much like the other powdered chais that you find served. Let me know how it goes! So….would it be similar to just buy black tea bags in bulk and cut them open? I tried that, and it just tastes like black tea…can hardly taste the spices. Any suggestions? I’m also in Canada so not sure where to get instant tea powder. 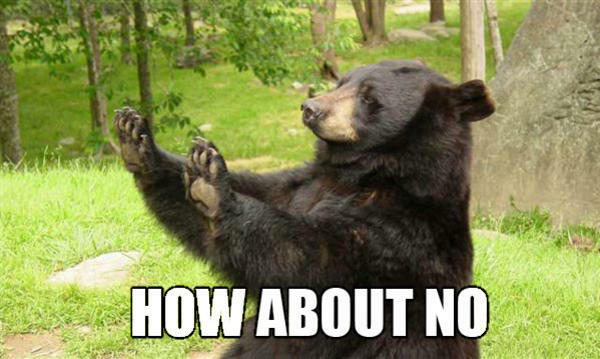 And now I just reread your post. We’re talking ice tea powder???? Minus all the sugar. Hmm…I’ll have to try again. Hi Katie, yes I had to cross the border to find unflavored instant unsweetened ice tea powder. If you can find sweetened powder (without lemon) in your area, you may be able to adapt the sugar levels to suit. Otherwise you’ll have to hike over like I did. Or maybe you can order from amazon? If one was to substitute loose leaf tea or cut the bags open instead of instant tea powder how much loose leaf or tea bags would you use. I would like to use a Dargelling tea. Thanks for your response. That’s a great idea. I have a nutribullet which has a grinder thing… I will give it a shot. 🙂 Thanks for letting me know you enjoyed it! Nice! I’ve been using soy milk to make mine (I don’t keep regular milk around much), but I’ll have to give this a try. Thanks for sharing your adaptation! Sounds good to me! I was looking for an iced adaptation! Great! I’ve been making this instant Chai mixture for about a year now. Unfortunately something doesn’t mix well. Maybe it’s the instant tea?! I’ve been using a blender, but should I be blending the instant tea before mixing it with everything else to make it more of a powder? When I’m finished with drinking the tea latte, there is bigger sentiment at the bottom. Also, I mix two-three cups of dry milk into the mix as well. It is true that there tends to be a little sediment at the bottom. This is not the tea… it’s bits of spices that don’t dissolve. 🙂 Things like cinnamon and allspice just won’t dissolve into the milk entirely, and that’s quite natural! It’s the same as making mulled cider with some of the ground seasonings. If you find it distasteful, you can try bagging servings with loose-leaf tea bags, but this might affect the flavour some. Hi, just coming across this recipe through Pinterest and can’t wait to try! I’ve never thought of using instant tea. How funny they don’t have regular iced tea up there! Funny meme at the beginning! I like what you are suggesting here with putting servings in a tea bag. Great for at work too. Thanks! Hi Claudia, I don’t recommend trying this recipe with the tea leaves themselves. Instant powdered tea contains no fibrous material and dissolves in liquid. If you do want to try to replicate with bag tea, leave the leaves in the bag and just add the sugar and seasonings to your cup. Thank you so much for this recipe! I doubled the spice amounts, but I must have dull taste buds! Haha! It’s wonderful! I also found that Lipton brand contains maltodextrin, so if anyone is concerned about that (it could possibly turn you into Hobbitses), the Nestea brand contains only tea. There are also decaf versions, but why?! Lol. Thank you again for your recipe! I’m sipping some right now and will have some tomorrow for second breakfast! 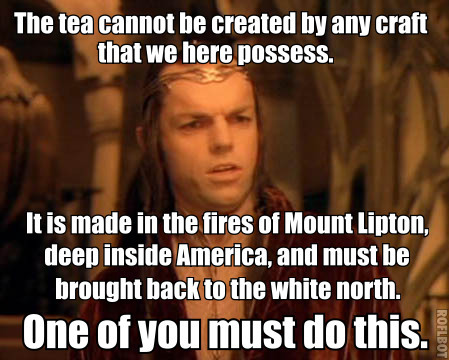 By the way, I’m so sorry you have to trek all the way down here to Mordor to find your tea powder. We do love to hoard our tea powder, I suppose! Our preeeeciooouuus! But, Nestle makes Nestea which is from Switzerland, so we can’t claim that…blame the Swiss and perhaps you can find that in the great white north after all! One can hope! I’m living in the province of Quebec and don’t know where to find instant tea. Do you know? Thank you ! Anybody who enjoys my sense of humour can be my friend. 😉 What good is being funny without an audience? love, Love, LOVE your wit! I have been making this for years in my coffee shop. New twist on it though, Frozen Chai Latte. Throw ice in blender, fill with milk to top of ice, pour in powder mix and BOOM! Add whipped cream on top drizzle with chocolate sauce and heaven awaits. I had lost my recipe for mix and now have found again thanks to you. Thank you again.